For Sale for restoration, is the 007 Film star Sean Connerys UK RHD polaris silver 3.0CSL. Model history - We have Anton Hille, the "live wire" MD of BMW Concessionairs GB to thank for the RHD CSL. The car was launched to the British market in October 1972, @ a list price of £6,299 ( rising to £7,499 by July 1973 ) the CSLs target market, was the well heeled professional, who enjoyed his motoring. Early owners included Heron groups Gerald Ronson who bought 2 new Verona red cars and BMW works driver Chris Amon who had an Inca orange one. A member of the 70s pop band 10CC also owned 2 Verona cars. Just 500 of these fabulous cars were built in RHD and probably fewer than 250 have survived. The UK CSLs specification, included steel bumpers, a deep Alpina front spoiler ( early built cars only, inc this one ) electric front and rear windows ( a few very early cars had manual windows ) an alloy bonnet, boot lid and door skins, superb Scheel bucket seats, an LSD and Alpina 7 x 14 alloys, which were covered by stainless arches. Distinctive “Tiger Stripes “ adorned the body sides. Many cars were fitted with a Petri steering wheel, inc Connerys one. These beautiful cars are one of the finest drivers cars ever built and their battles with the Capri RS2600s in the ETC race series, driven by the likes of Alpina drivers Brian Muir, James Hunt and Nicki Lauda, plus works drivers Hans Stuck and Chris Amon, are the stuff of legend. At some point in the 60s, he also owned a grey Bentley S.2 and in the late 1980s a white BMW 635CSi. 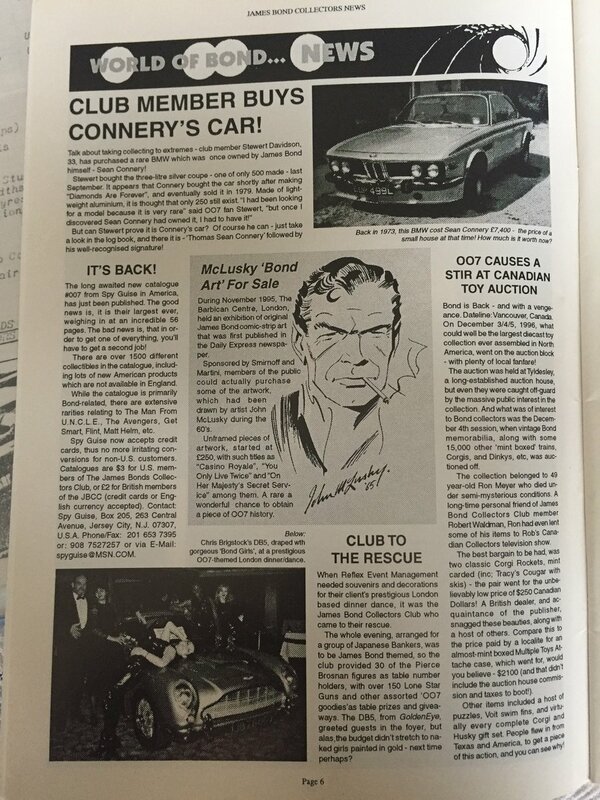 But on July 25th 1973 and $$ flush, after being paid for his sixth 007 Bond film “Diamonds are Forever“ he took delivery of his new CSL, via BMW main distributors for Yorkshire, Pennine Motors, of Dewsbury Road, Leeds. 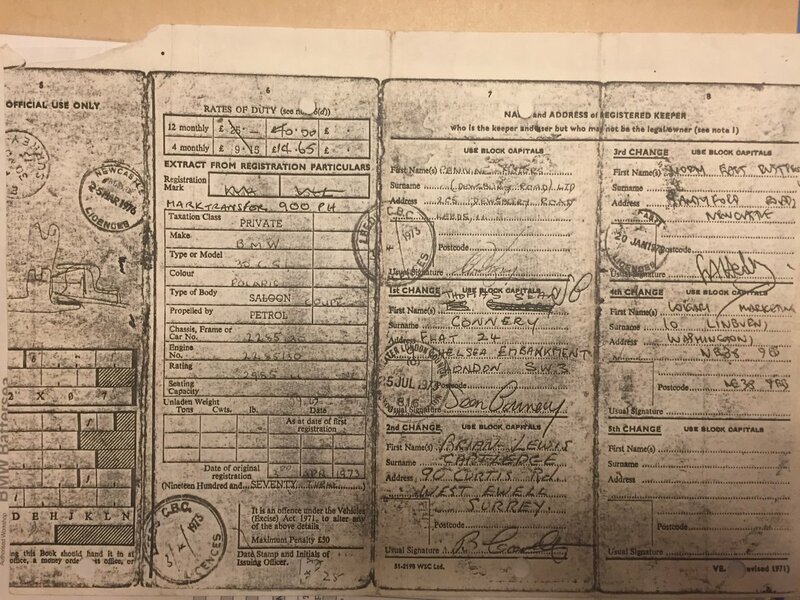 He registered the car to his London flat, which was situated on the Embankment, over looking the river Thames, at Chelsea. At well over £7,000 (a huge sum of money then) he could have chosen any number of superb fast cars, but it says something, that he chose a CSL. 1973 was a difficult year for him, as his bitter divorce with Diane Cilento wasnt settled until September, but no doubt, his CSL gave him great pleasure. We have been told that he took his CSL over to Ireland whilst filming Zardoz and that he also had a telephone fitted. It appears that he kept this car until some time in 1976, when ownership passed to a Brian Lewis Cartledge, of West Ewell Surrey. By the late 1970s, the car passed into the ownership of prominent northern businessman Frank Hedley, with his wife using it as her daily driver, carrying her personal number plate 900 PH. 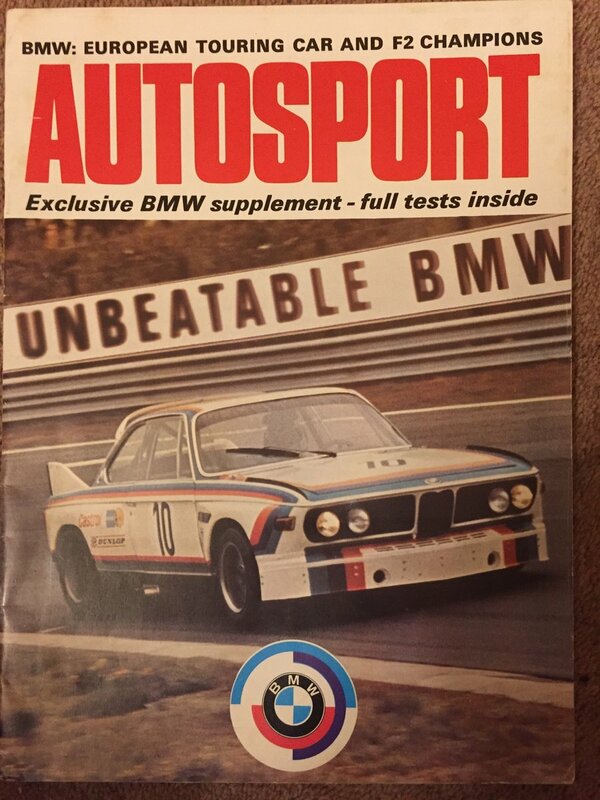 In October 1980, Frank lent their CSL to Motor magazines Editor / and former BMW Dealer Team UK 3.0Si race car driver, the very quick, Roger Bell, for what Bell described as “A week of fabulous motoring”. 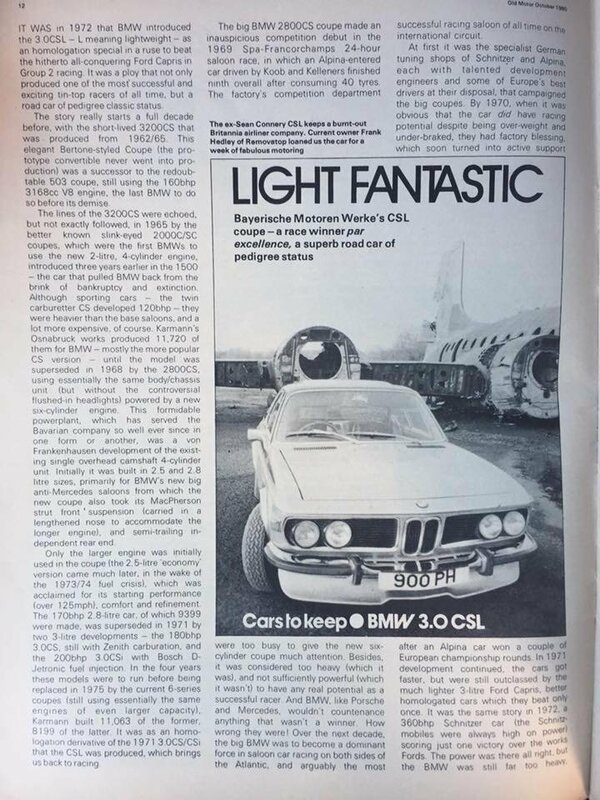 Bells definitive CSL feature, which he wrote for the October 1980 issue of Old Motor magazine (which today is Classic and Sportscar magazine) is the finest CSL article ever written and featured Connery’s old car. Sadly, Frank Hedley passed away far too young, in the early 1990s. This car has also featured in “Collecting Bond“ magazine in the late 90s and in several newspapers, including The Sun. 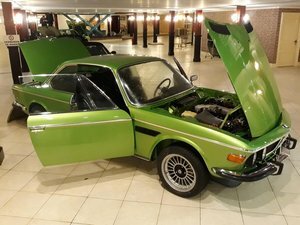 Its original / matching numbers 3 Litre straight six engine, was fully/professionally rebuilt by BMW at huge expense some years ago, the rebuild included the fitment of a new Shrick 282 camshaft and it has covered very little milage since. The car is now dismantled to a rolling shell and work has started. 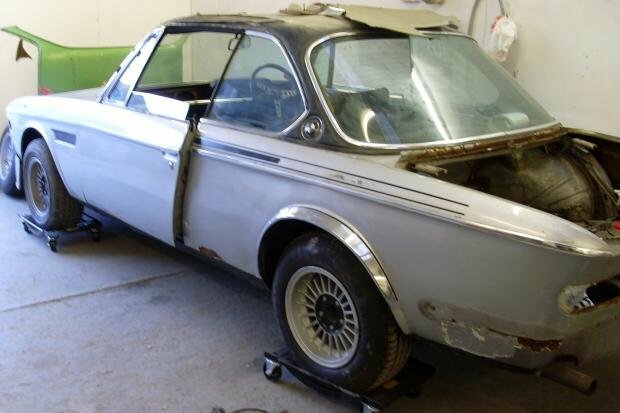 A superb range of body repair panels, trim, mechanical and electrical parts are readily available for these cars via Walloth Nesch and BMW Classic. Supplied with this car, are a selection of new body repair panels. We can also highly recommend the worlds leading CSL / E9 restorer, Miklos Mezarios @ CSLs garage (check out "CSLs Garage” on Facebook) to restore this car for you. Miklos has already inspected the car. We could also project manage the restoration for you. 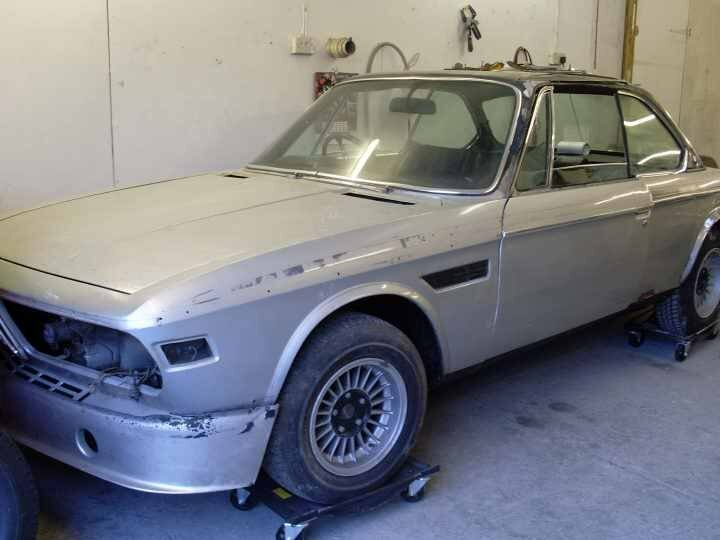 Miklos is currently restoring ex BMW works CSL driver, Chris Amons old Inca Orange CSL, a Taiga green CSL and also the ex Abba 3.0CS. 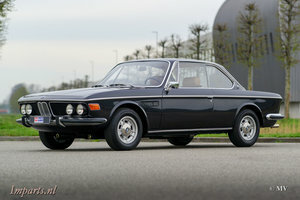 This is a fabulous opportunity to add the most famous road going 3.0CSL ever buit, to your classic car collection. A cheaper exchange will be considered, inc an Espada, Aston, Alfa Montreal, Pantera, 911, Z/28 Camaro, E46M3, TVR, Corvette, Super Bikes, inc MV, Ducati 888 / 998 / 1098 / Panigale, etc etc. World wide delivery is available. Serious Buyers only, please contact us for more details. Thanks.